This review was written October 28th 2003. I had borrowed King George 111 from my son David’s library. Including the index and references, it ran to 640 pages and was heavy going at the start but proved later to be both entertaining and very educational. It was an important addition to my knowledge of England’s history. The author was obviously strongly prejudiced in favour of the King and he disabused the popular opinion that he was mad during his reign. He did have a few serious illnesses during the later days of his reign but he was clearly an admirable person during his many normal years and greatly revered by his subjects. About ten years ago it was stated in the British Medical Journal that the King’s illness was caused by a metabolic disease called porphyria. This explanation of the King’s two serious bouts of illness raised much interest among historians and doctors but the diagnosis was firmly denied by Dr. Geoffrey Dean, the head of the Medico-Social Health Board in Ireland who had a world reputation on the subject of porphyria. Dean was born in England, emigrated and succeeded as a neurologist and research worker in South Africa where he published a book, among other original works, on porphyria. Because of his research reputation he was appointed to the head of the Irish organisation at its inception in the 1970s. The King’s illnesses were associated with some severe mental changes which might well be described in these early days as a form of madness but the treatment he received from his doctors was appalling and his management by them and other advisors was, to my mind, a major cause of his two prolonged illnesses. There was absolutely no rationale at the basis of his treatment and there was much harm in prolonging and aggravating his symptoms by medical intervention. Constant bleeding, cupping with hot instruments and restraining him in a straight jacket for long periods were only some of his sufferings at the hands of his physicians. Too often his response and reaction to physical confinement and grossly irrational treatment was interpreted as part of his madness. His too numerous doctors were totally ignorant of the nature of his illness and were clearly responsible for prolonging his confinement and isolating him from his wife for long periods of time and from his family, friends and Court and political colleagues. We were to wait more than another one hundred and fifty years before the concept of evidence-based medicine was established and applied to medical practice. George III was the grandson of George II. He succeeded his grandfather in 1760 when he was 22 years of age. He had a long reign of 57 years. (Elizabeth II is now in the 57th year of her reign.) George I, the monarch of the German State of Hanover had become King of Great Britain and Ireland after the departure of William III of the Bottle of the Boyne fame. He was chosen for want of a better choice after William retired and more senior members of his Hanoverian family were rejected because they were Catholics. The Georges continued to remain heads of the small North German State. The first George rarely visited London and had little interest in the British nor had they in him. 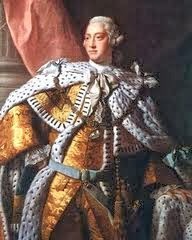 However, George III had little interest in Hanover and his connection with the small and unimportant North German State. He never visited Hanover during his long life in England. He reigned during the American civil war, the ‘French Revolution and the Dublin Parliament and its abolition in 1801 after the 1798 Rebellion. It was an important time in the history of Britain and was to see many changes in the political, social and commercial lives of the people. There is no evidence that George paid a visit to Ireland and, with those of his subjects who gave a thought to Ireland, he was distinctly opposed to any form of independent spirit among the Irish and probably too to its Protestant Parliament. He was to the very last opposed to American independence and maintained a consistent policy of army intervention in resisting American patriots. He was certainly opposed to the more liberal views of Edmund Burke and some of his Whig colleagues who supported the Irish Parliament, despite the exclusion of Catholic and non-Anglican members and the restrictions of Catholics in many aspects of Irish life. Edmund Burke was also a good deal more realistic in thinking that such a remote and rapidly expanding and influential community as the Americans was unlikely to retain the influence of Westminster in its affairs. The book is worth reading for its historical and educations value. It provides good insights into the political and parliamentary system which prevailed in Britain and which emphasises the long and progressive tradition of parliament and the British people in tandem with the continued existence of royalty. 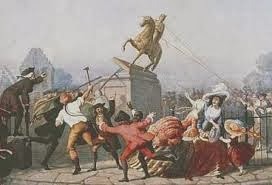 It was a reminder that democracy can exist in cohesion with a monarch and certainly establishes the British claim to be the birthplace of the democratic system combining a people’s electoral influence with a monarchy with a still influential role but deprived of any significant political power. This book has added to my knowledge and interest of British history and is a reminder that, despite the political division between Ireland and Britain in more recent times, we shall always remain in close contact with our neighbouring island in terms of social, cultural, traditional and language terms and to the mutual advantage of both. One must wonder whether 1916 and the rhetoric of the Republic, and the ensuing Civil War, was a better prospect than Griffith’s dual monarchy with Ireland in charge of its own affairs but as part of a federation with England, Scotland and Wales and linked solely by the Crown but sharing the many attributes which were and still are common to the four countries. As an offspring of one who was active in 1916 and who remained an important influence during the revolutionary period afterwards, I believe we would have reached an early settlement based on our increasing aspirations aimed at self-rule after the Great War without the intervention of the few who precipitated the 1916 rebellion and the subsequent futility and tragedy of the Civil War and the deepening of the division between South and North.